Today marks the 70th anniversary of a revolt by Jewish prisoners at Auschwitz-Birkenau, in which 60 Greek Jews are believed to have participated and died. Before the outbreak of the Second World War, there were 25 distinct Jewish communities in Greece, by far the largest being in Thessaloniki (with 56,000 Jews), followed by Athens, Kavala and Corfu. The impact of the Nazi death machine on the Greek Jewish community – which could boast a centuries-long presence in Greece – was devastating, and this dark story is now related in Greeks in Auschwitz-Birkenau, authored by Photini Tomai, director of the historical archives of the ministry of foreign affairs. Relying on survivors’ written and oral testimony and archival research, the book is excellently illustrated, containing many photographs of Greek victims of the Nazi death camps. In all, 67,000 of Greece’s Jewish citizens, or 86 percent of the community, lost their lives in the Holocaust, most of them at Auschwitz. Of the 550 Jews of Xanthi, for example, only six survived the Nazi Judeocide. Only the Jewish community of Zakynthos survived intact, thanks to the bravery of the local bishop, Chrysostomos, and mayor, Loukas Carrer, who refused, at great personal risk, to hand over the names of the island’s Jews to the Germans. Demonstrating the shocking bureaucratic-industrial efficiency with which the grotesquely euphemised Final Solution was organised is the fact that within five months, in 1943, the Nazis succeeded in deporting by rail 48,233 Jews from Thessaloniki to the various Auschwitz camps. Most never returned – 96 percent of Thessaloniki’s Jews were murdered. On arrival at the notorious Death Gate in Auschwitz-Birkenau, the vast majority, particularly the elderly, children and women, were immediately selected for the gas chambers. Others were handed over to Josef Mengele, Carl Clauberg and others for the purposes of torturous and barbaric medical experimentation (in cases on behalf of major German pharmaceutical companies such as Bayer) and dismemberment. Graphically described by Greek survivors, both Jewish and Christian, the gruesome experiments were primarily focused on sterilisation techniques. The able-bodied were usually deployed to work in the crematoria or in the ranks of the Aussenkommando, a hard-labour force that effectively worked people to death. Apart from the Greek Jews, a number of Greek Christians also ended up in Auschwitz, including a number of resistance fighters. Most were women, such as Vasso Stamatiou from Thessaloniki, still alive today, whose recollections figure throughout the book. There were some brave acts of resistance, for which their participants paid the ultimate price. Upon their arrival in Auschwitz, in June 1944, some male Jews from Corfu were ordered to work in the crematoria. They refused and were shot on the spot. Some months later, on 7 October 1944, over 60 Greek Jews, led by Josef Barouch (photo), an officer in the Greek Army from Ioannina, participated in an uprising in Birkenau which succeeded in killing several SS men and blowing up crematorium IV, using dynamite supplied by women working in a camp factory. As Tomai points out, this was the “sole incidence, throughout the operating life of the Nazi concentration camps, of an organised uprising”. The ministry of foreign affairs is to be congratulated for publishing this book – the contents of which deserve a greater place in the historical consciousness of this country – simultaneously in Greek and English. However, proper attention should have been given to the English translation and editing, which leaves much to be desired. 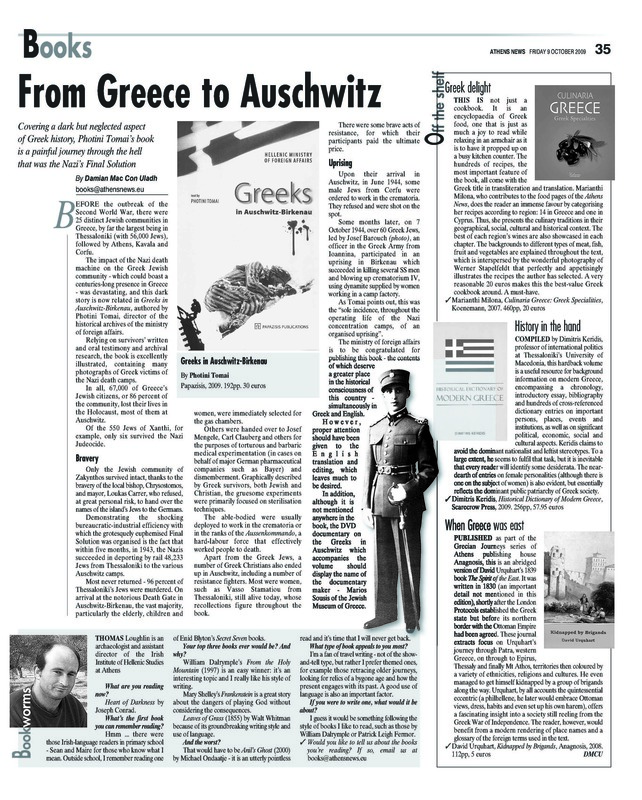 In addition, although it is not mentioned anywhere in the book, the DVD documentary on the Greeks in Auschwitz which accompanies the volume should display the name of the documentary maker – Marios Sousis of the Jewish Museum of Greece.